“Over decades of research, multiple peer-reviewed studies have been conducted to measure the maximum amount of time that CO2 remains in the atmosphere before being recycled by the oceans. Almost all studies have determined that the maximum time is less than 15 years, with the majority of studies indicating under 10 years. See graph to left. 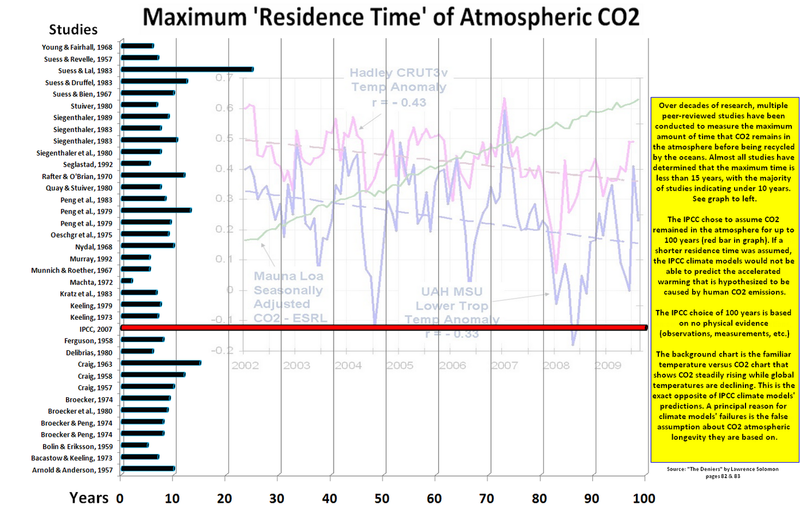 The IPCC chose to assume CO2 remained in the atmosphere for up to 100 years (red bar in graph). 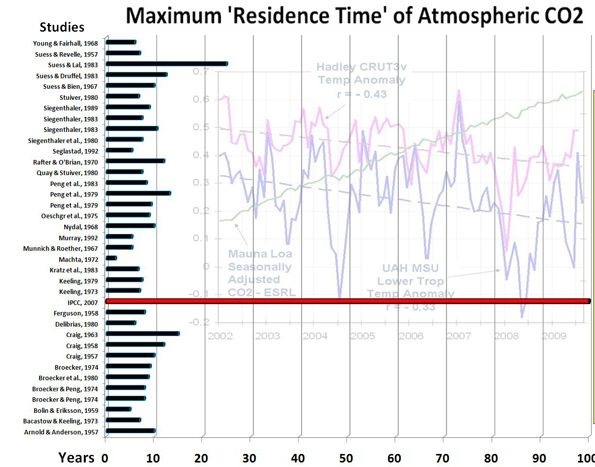 If a shorter residence time was assumed, the IPCC climate models would not be able to predict the accelerated warming that is hypothesized to be caused by human CO2 emissions. The IPCC choice of 100 years is based on no physical evidence (observations, measurements, etc.). “[Republican candidate for governor of California Meg] Whitman issued a statement again slamming [California’s “global warming”] law, referred to as AB32, calling it a “job-killing regulation.” She previously made critical comments in Orange County on Tuesday, when she formally announced her campaign for the GOP nomination next year. “Global warming lawsuits [Earth to enviros: the planet has been cooling for a decade] brought by New York State and others who challenged major utilities on carbon-dioxide emissions from coal-burning power plants were reinstated Monday by the 2nd U.S. Circuit Court of Appeals. Southern District Judge Loretta A. Preska had dismissed the suits against American Electric Power Co. and five other operators of fossil-fuel-fired power plants in 2005, finding that the plaintiffs — eight states in all, New York City and three private land trusts — had pleaded a federal common law of nuisance action that was non-justiciable under the political questions doctrine. “California’s drought-stricken San Joaquin Valley [f]armers, families and food are being held hostage to an endangered fish called the delta smelt. There was a time when the San Joaquin Valley was the most productive agricultural region in the world. It was a large part of what made the Golden State golden. Now it’s a place where farmers no longer farm, but instead line up at food banks to feed the families of those who once fed the rest of the country and a good chunk of the world. The largest man-made agricultural disaster since the Dust Bowl of the 1930s is unfolding in the valley due to yet another attempt to protect a fish declared to be threatened under the Endangered Species Act. This damage is being done to protect the hypomesus transpacificus, otherwise known as the delta smelt. Last December the U.S. Fish and Wildlife Service, in its finite wisdom, issued something called a biological opinion imposing water restrictions on the San Joaquin Valley and surrounding areas to protect the habitat of this tiny fish. The authorities forget the species homo sapiens, also part of the ecosystem, is threatened. Its habitat is being destroyed — by government edict. To protect the smelt, billions of gallons of water from the mountains east and north of Sacramento have been channeled away from farms and into the ocean, while farmers watched their crops wither and their once-productive land become barren. Kern County authorities say that 145,000 acres that are usually irrigated with this water were killed or underirrigated last year. The loss was estimated at $100 million in that county alone. The University of California, Davis, estimates that San Joaquin Valley farm revenue losses ranged from $482 million to $647 million. Total economic losses could hit $3 billion this year. In affected areas, the jobless rate is at 14%, with farming towns such as Mendota experiencing unemployment near 40%. In August, 50 valley mayors signed a letter to President Obama asking him to come and witness the devastation firsthand. “[G]overnor [Schwarzenegger] is still fighting to convince all Californians the state should go full steam ahead with its climate change plans, but he said he would not back down. “A tiny car company backed by former Vice President Al Gore has just gotten a $529 million U.S. government loan to help build a hybrid sports car in Finland that will sell for about $89,000.